This day was totally relaxing. We had breakfast at 9am - so very late for our trip. Then our “fun bus” took us to Ambolimalika village, where we stayed for a couple of hours. We had time to swim in the ocean, sunbathe on the beach, and walk along the coast. 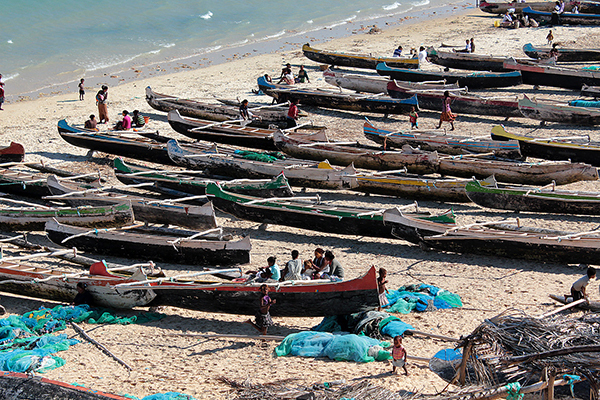 We also watched the fishermen – hundreds of boats came to the beach in Ambolimalika, selling different goods, like fish of sugar canes. The view was stunning, the whole beach covered with colorful boats. A few people even sailed with fishermen in their boats for a while. Then we had lunch, again local band played, sang and danced for us. The girls were amazing singers and dancers, with incredible twerking skills! We got back to the Nautilus Hotel about 3 pm, we had time for ourselves, to swim, to walk on the beach. After dinner we had a party with some quite modern guitar rock music, and a lot of people were dancing and having fun, clearly everybody got some rest after an interesting but tiring week. Next day we used our truck to visit fishermen village Ambolimalika. T. Praszkier photo. 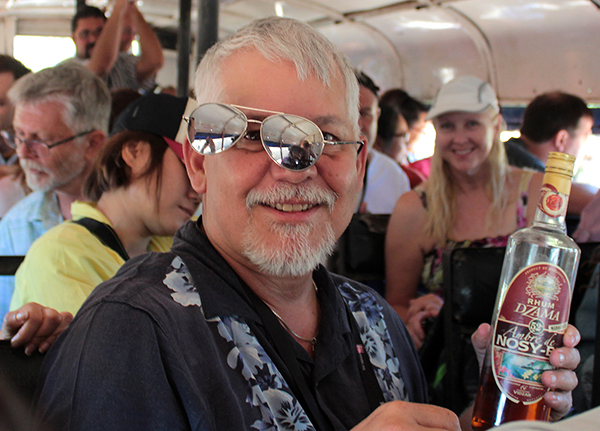 And of course we did not forget about the rum! E. Petrides photo. John Veevaert with his breakfast. R. Lang photo. Monica drinking breakfast ;-) M. Southwood photo. Restaurant with great panoramic view was waiting for us in Ambalimalika. M. Yu photo. Relaxing with beer and great view. R. Lang photo. 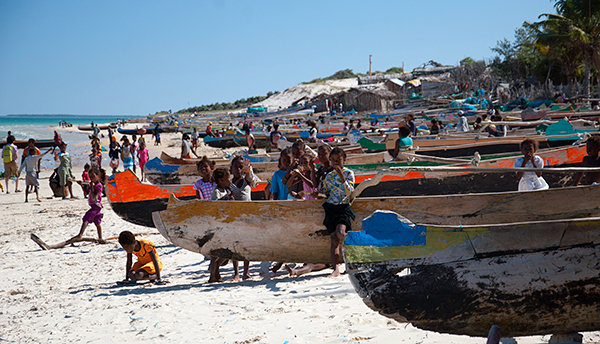 Ambalimalika is a fishermen village with hundreds of boats going to fish daily. E. Petrides photo. Beach in Ambolimalika. R. Lang photo. Crowded beach. C. Voogt photo. Women in sunscreen masks. E. Petrides photo. Fishermen just arrived. E. Petrides photo. Some participants took a tour in catamarans K. Doxsee photo. Crabs on the beach. M. Ng photo. Freshly brought from the sea. K. Doxsee photo. Some of the fish had spectacular colors and forms. E. Petrides photo. Kids having fun on the beach E. Petrides photo. Bird Madagascar crested drongo. S. Szlinke photo. 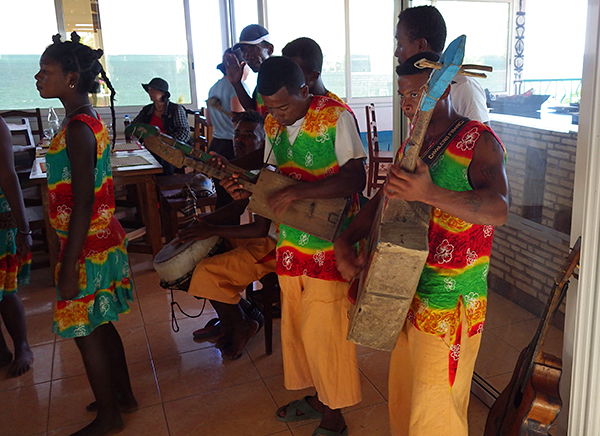 During lunch we had group of local musicians. N. Anstee photo. Lunch time! M. Yu photo. And time to come back to our hotel ... M. Ng photo. ... for the relaxing afternoon. M. Ng photo. Relaxing afternoon. L. Albin photo. Evening party. L. Albin photo. Last sunset on the beach. L. Albin photo. Last sunset on the beach. M. Ng photo. Last sunset on the beach. E. Petrides photo. And dinner with huge amount of food. M. Ng photo. 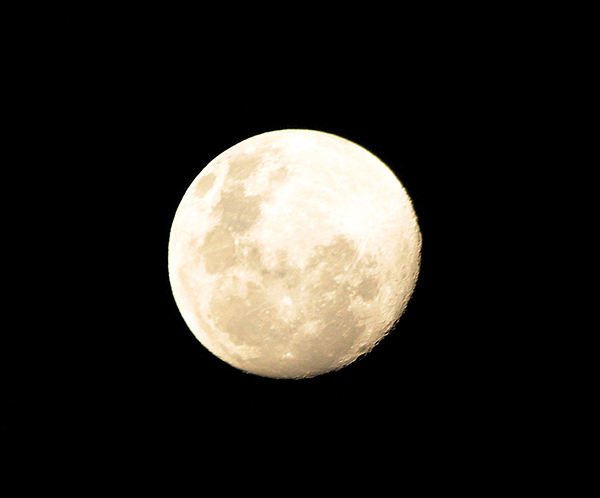 Beautiful moon R. Lang photo. We left the hotel late, at 11.30 am. We drove to Tulear, had lunch at Etoil de Mer again, and from there we drove to the airport. 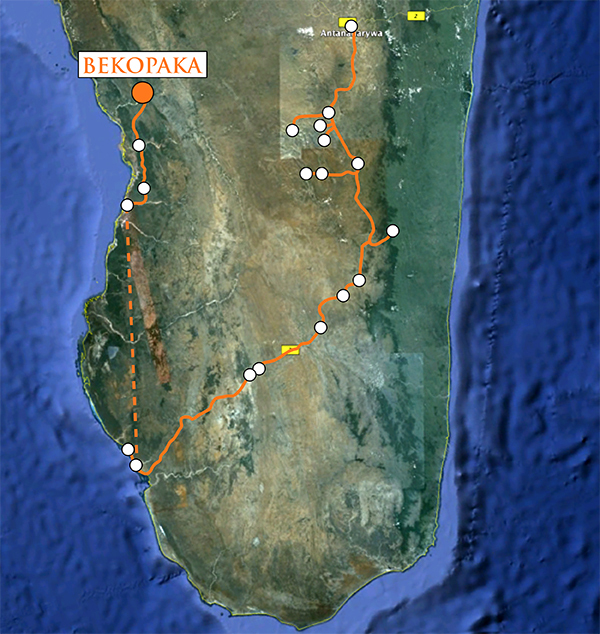 We were having a flight to Morondava, a bit to the north. 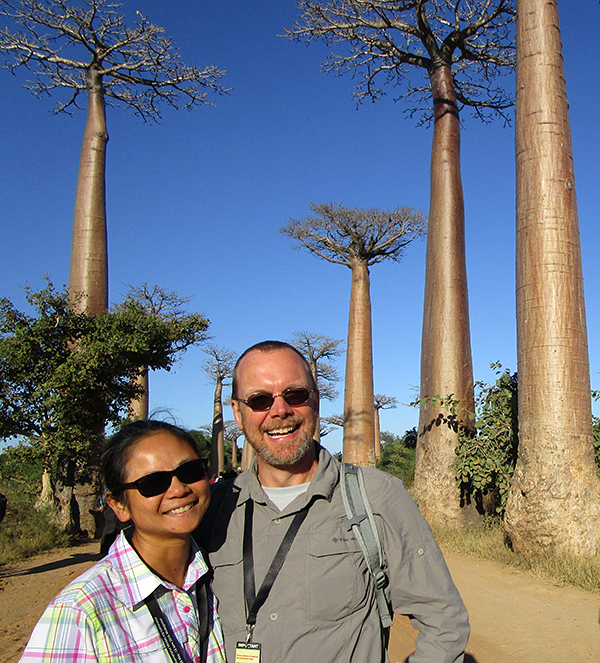 It was one of our two completely rented plains, what is not easy to organize at Madagascar! We chartered the whole plane for our group. The flight took slightly more than an hour. Our 4WDs picked us up from the airport. 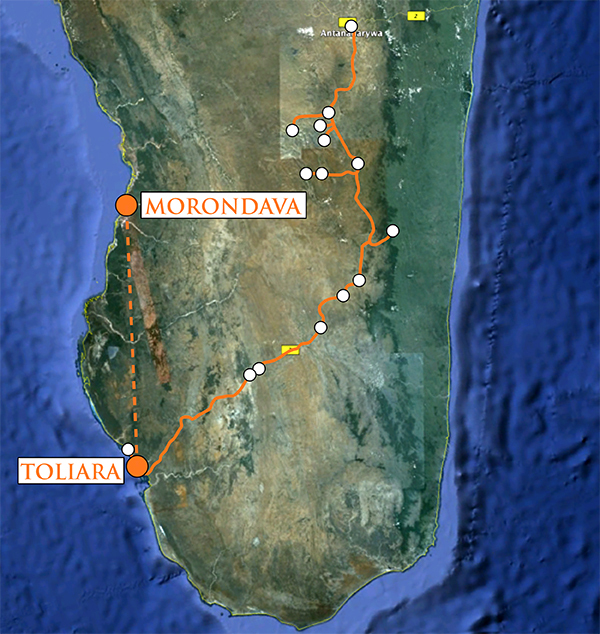 They had a long way to get to Morondava from Tulear, so some of them were a bit late. In the end everyone got to their hotels, and we had dinner in Kimony Resort Hotel, where most of the people were staying. After the dinner some people were still partying in the restaurant, some by the pool, and some moved to their rooms. 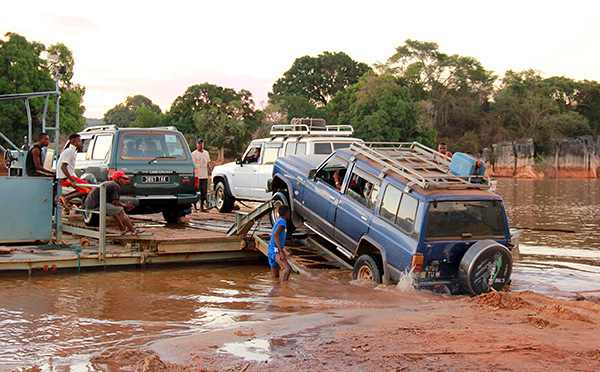 Next morning we drove back with our truck to Toliara where we took flight to Morondava. Google Maps. We rented the whole plane. It was the first Mindat Flight ever :-) M. Yu photo. Plane is waiting for us. E. Petrides photo. Mindat plane. M. Ng photo. After 1 hour flight we arrived to Morondava. 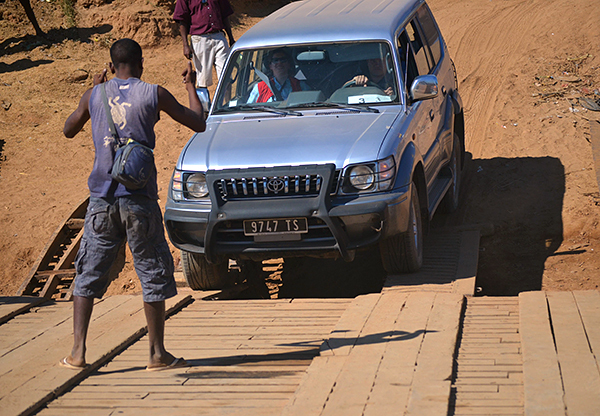 We had to wait for our cars which had to make 1800 km of tiny Malagasy roads in 2 days. They arrived after 1 hour. S. Szlinke photo. 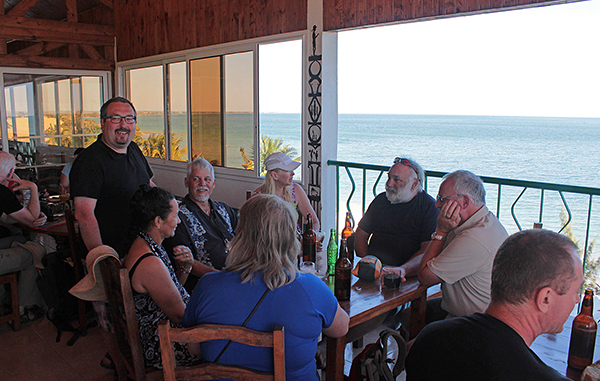 Finally all of us were in the hotel having a nice evening in Morondava. S. Szlinke photo. 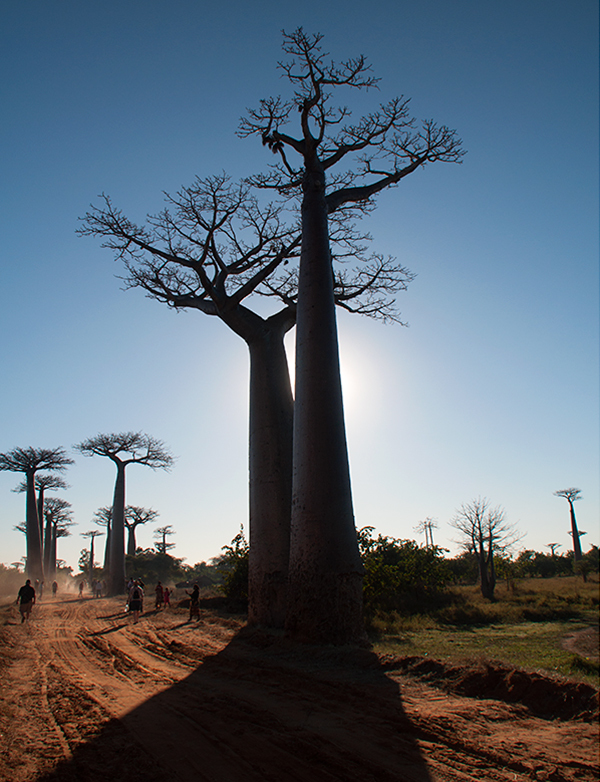 We checked out at 7am and drove to the famous Avenue de Baobab. Everybody was overwhelmed by the place and the trees, but it was not so easy to take a good photo when there were 60 people running around! 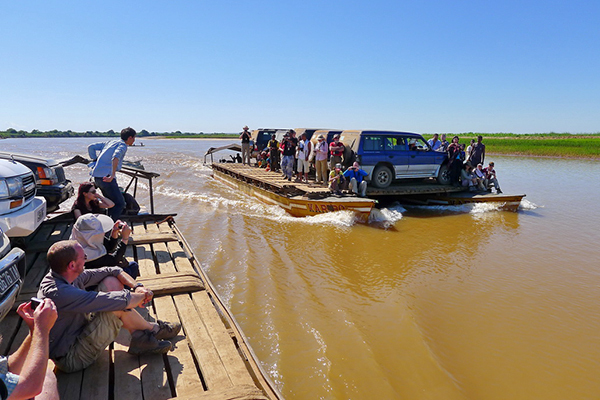 :) Then we drove to Belu sur Tshirbina village, where we took a ferry to the other side of the river. 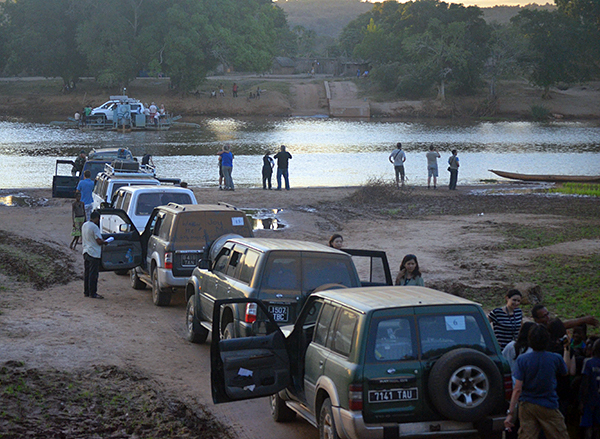 Because of the large number of cars we needed 3 ferries, all of them were waiting for us, so the operation went very quickly. On the other side we had lunch at the Mad Zebu Restaurant, which is said to be one of the best on Madagascar. We had a really good meal there, and after it we drove to Bekopaka village. 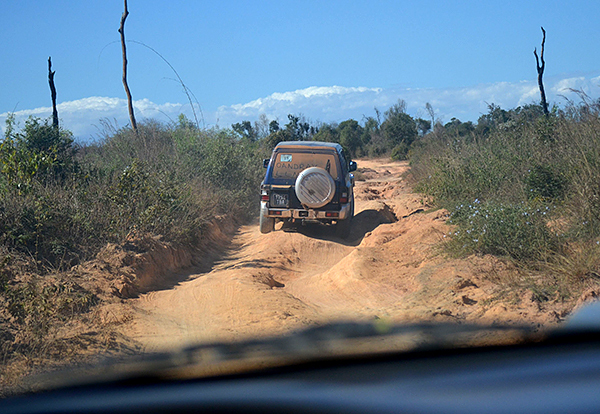 The drive took quite a long time, the road was bad, through bush and jungle. Just before Bekopaka there was another river so we had to take another ferry. 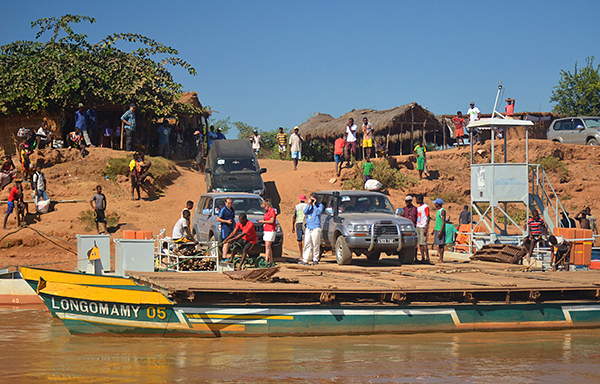 Unfortunately the engine was broken, so the Malagasy guys working on the ferry used long sticks to move the ferry across the river. It must have been hard with 3 cars on board. It took a long time to transport all of the cars. In Bekopaka we checked in the Olymp Hotel, where we were staying for 3 nights. The evening ended up quite early as the people were exhausted after a long drive. Next day was very long. 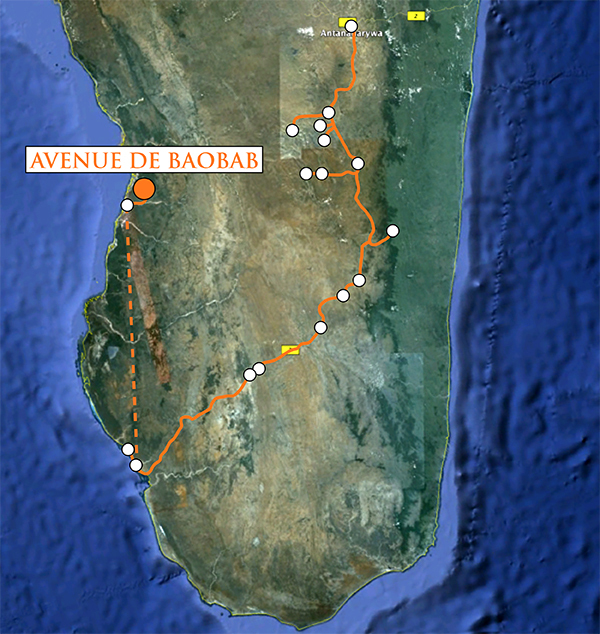 We started early morning driving first to the famous Avenue de Baobab. Google Maps. 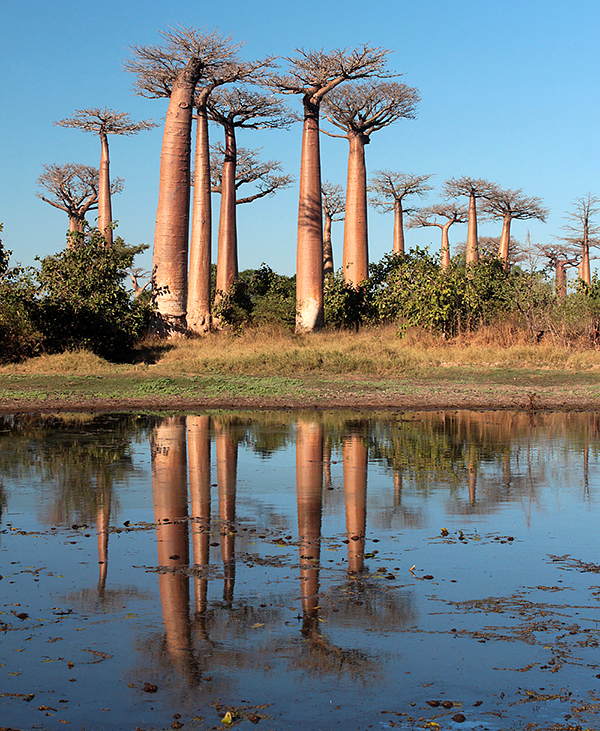 Avenue de Baobab area. E. Petrides photo. 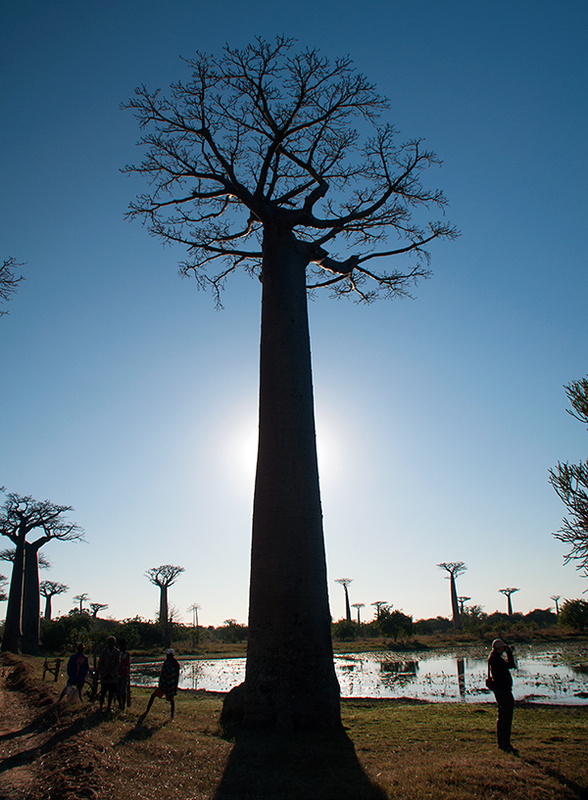 Big baobabs in Avenue de Baobab. S. Szlinke photo. Big baobabs in Avenue de Baobab. C. Voogt photo. Big baobabs in Avenue de Baobab. R. Lang photo. 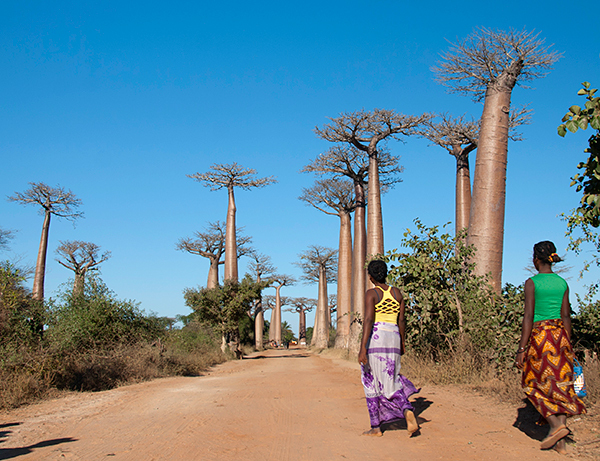 Avenue de Baobab. E. Petrides photo. Monica and John seemed happy on Avenue de Baobab. J. Rakovan photo. 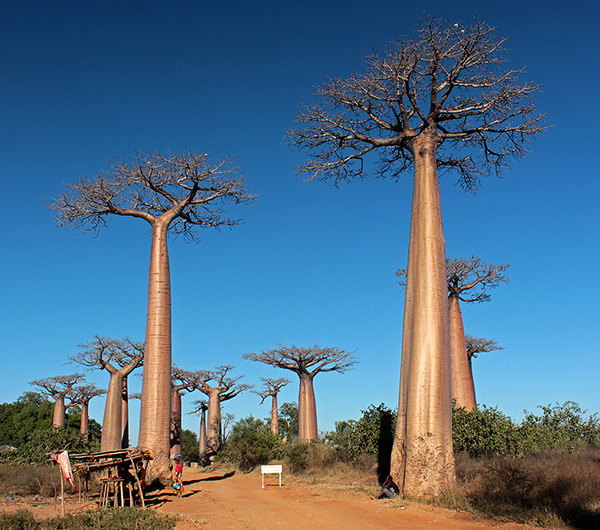 Avenue de Baobab. M. Southwood photo. 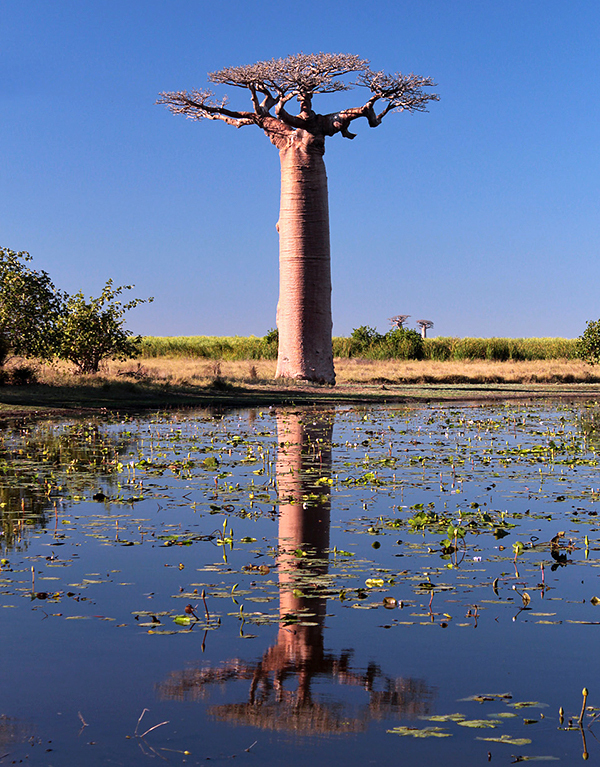 Avenue de Baobab. R. Lang photo. Hong-Kong gang became crazy on Avenue de Baobab. I. Chau photo. From baobabs we drove 3 hours to the first ferry that day. It took us through Belo sur Tshirbina. Google Maps. Ferrys are small so we booked all of them in advance. They waited for us. J. Rakovan photo. Going to the ferry. N. Anstee photo. 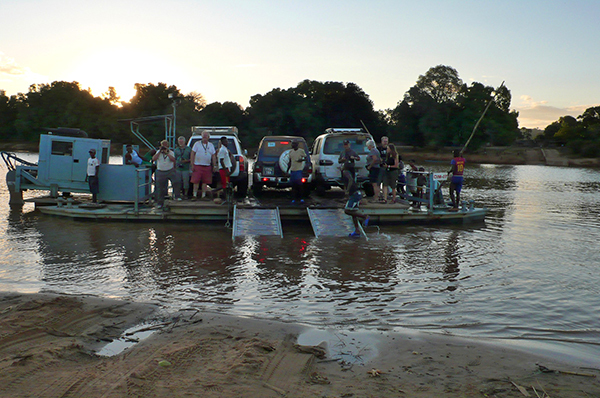 Loading ferry. N. Anstee photo. Ready to go. K. Luk photo. On the way to Belo sur Tshibina. R. Zeilstra photo. 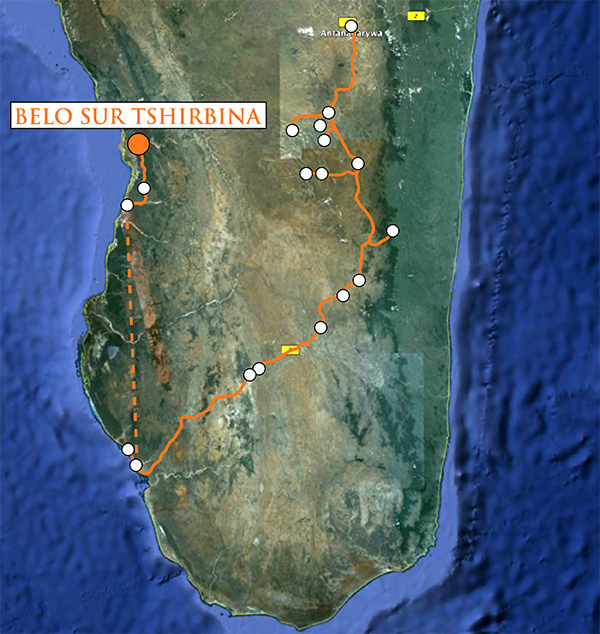 On the way to Belo sur Tshibina. E. Petrides photo. River is quite busy, there is a lot of boats. M. Southwood photo. Finally we reached Belo, the end of the civilization and start of the very bad road. E. Petrides photo. 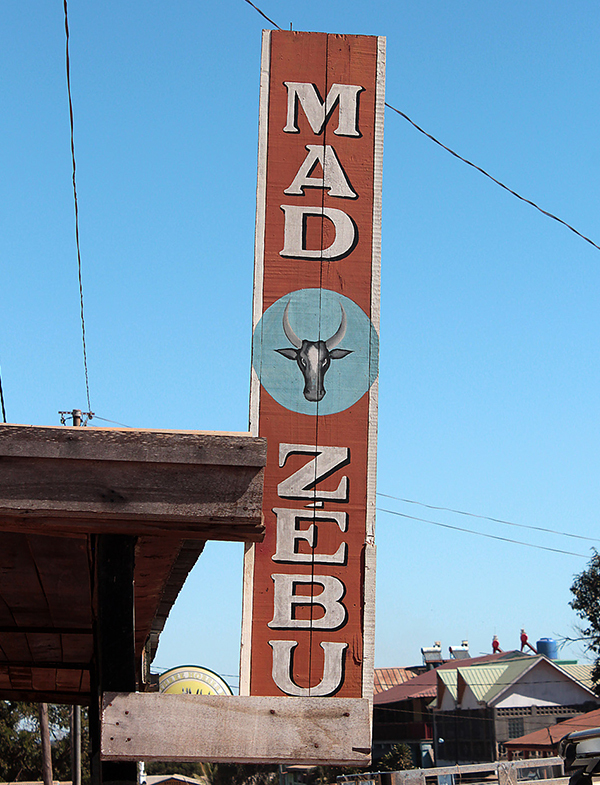 But first we had lunch in Mad Zebu restaurant ... R. Lang photo. ... in our opinion the best restaurant in the whole country! T. Praszkier photo. Toilets sign in Mad Zebu. E. Petrides photo. After lunch we started 5 hours drive (100 km) with a really bad road to Bekopaka. Google Maps. Road to Bekopaka. E. Petrides photo. Road to Bekopaka. N. Anstee photo. 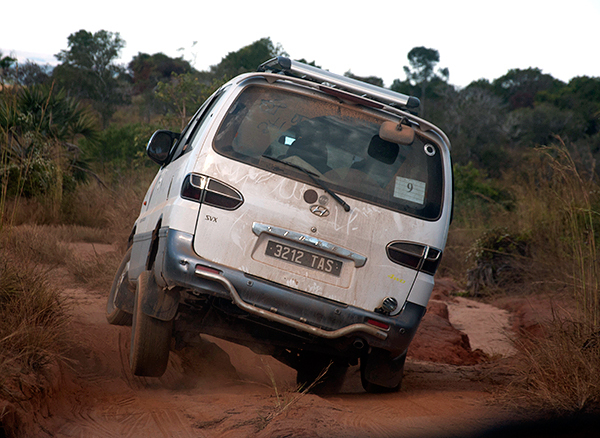 On the road to Bekopaka one of the cars broke, our Malagasy team used free time to dance in the bushes. R. Lang photo. When car was fixed we continiued our road to Bekopaka. C. Voogt photo. 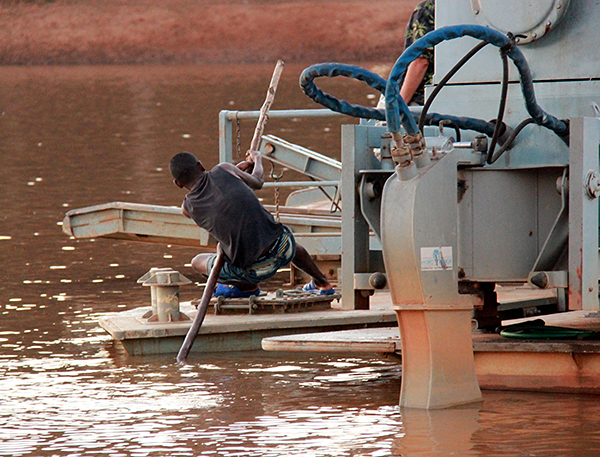 Close to the Manambolo river kids caught a small crocodile. E. Petrides photo. Bird hunter. E. Petrides photo. 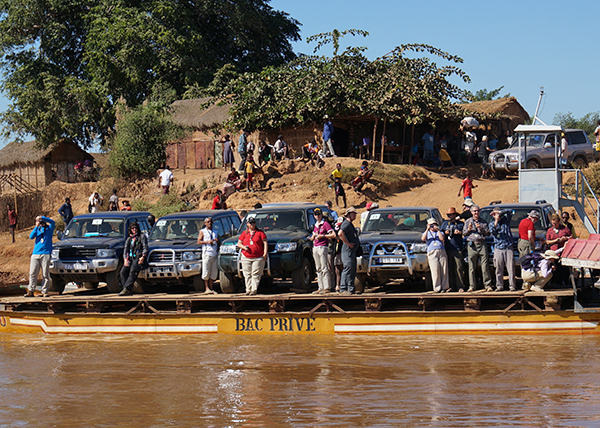 Our cars waiting for the small ferry at the Manambolo river, fortunately crossing takes only 10 minutes. N. Anstee photo. Malagasy style of loading cars. R. Zeilstra photo. Ferry on its way. M. Southwood photo. But wait! Is that true? Engine was broken and this poor guys moved the whole ferry full of cars using only his muscles... R. Zeilstra photo. Crossing the river. M. Southwood photo. 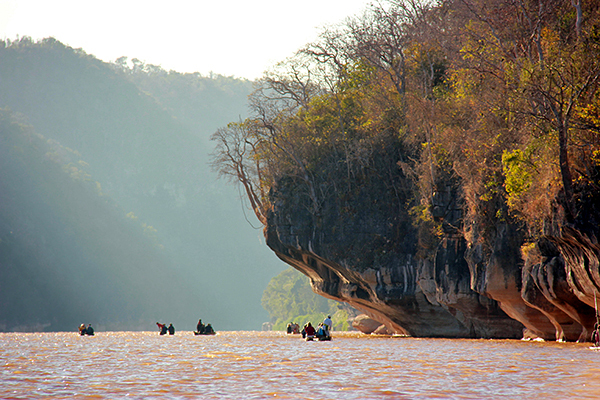 In the morning at sunrise, before breakfast, we took a river trip in traditional dugout canoes. 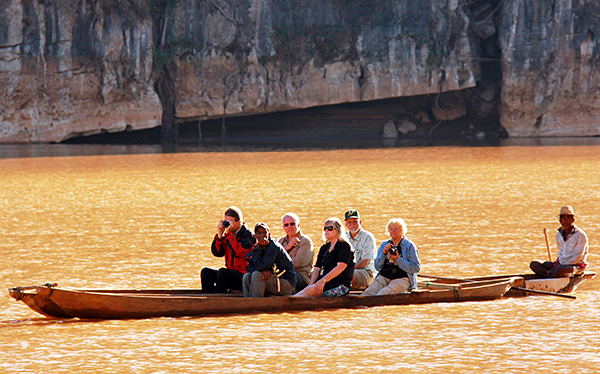 Unfortunately the guides were late so we had to wait for them for about an hour by the river. We navigated through the gorge of the Manambola river and visited a cave there. It was a beautiful morning with fog rising off the surface of the river and light from the rising sun diffusing through the mist to the water. 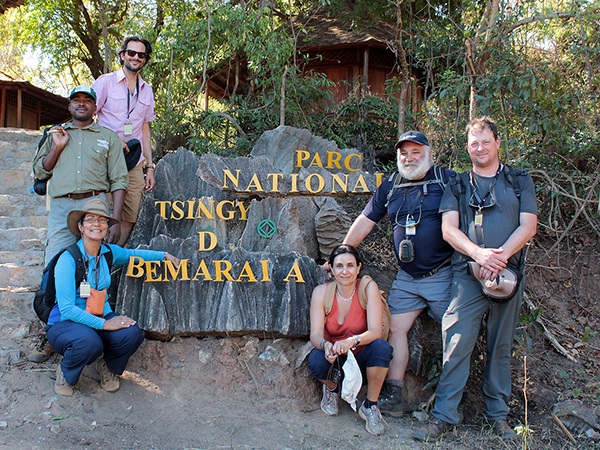 Then we returned to the hotel to have breakfast, and drove to Tsingy de Bemaraha National Park where we visited the “small" Tsingy. 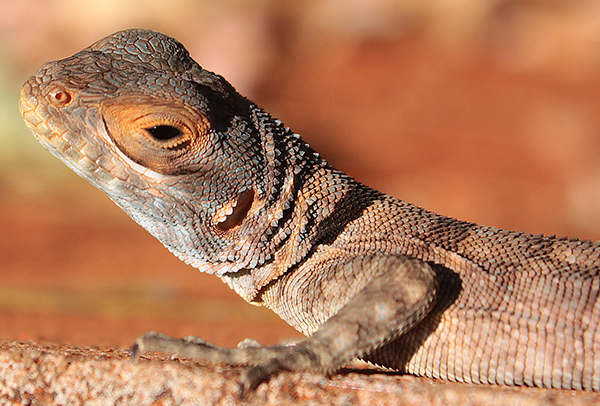 It was a 3 hour trip and a good chance to prepare for the “big” Tsingy. 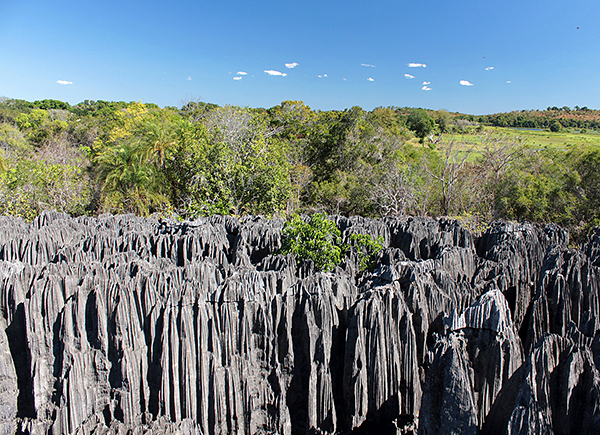 The Tsingy is one of the wonders of Madagascar, and it has been recognized as a UNESCO World Heritage Site. Its razor sharp pinnacles were produced by the surface weathering of the limestone massif by acidic rain. Caves have developed beneath the surface and narrow canyons created along cracks and joints in the rock mass. There’s also plenty of interesting wildlife there. We got back to the hotel about 2 pm, had lunch and free time. 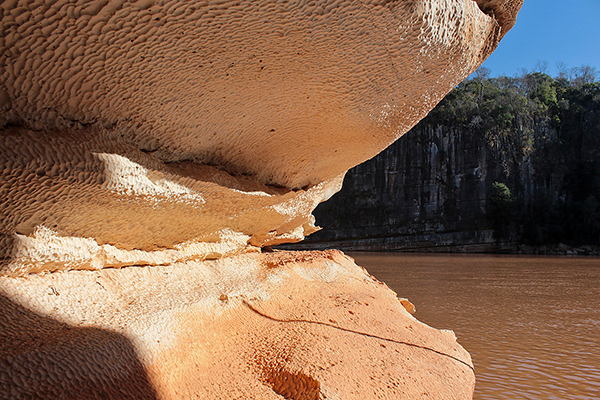 Next day we started visiting Manambolo river and "small" Tsingy, part of the Tsingy de Bemaraha National Parc. Google Maps. Early morning drive to the river. E. Petrides photo. Manabolo in the early morning. E. Petrides photo. Manabolo in the early morning. S. Szlinke photo. Manabolo in the early morning. K. Doxsee photo. Kids on the beach. E. Petrides photo. 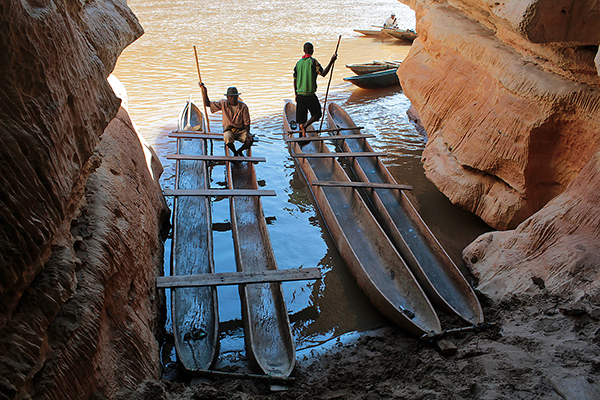 We took traditional boats "piorogues" and went to the Manambolo gorge. R. Zeilstra photo. 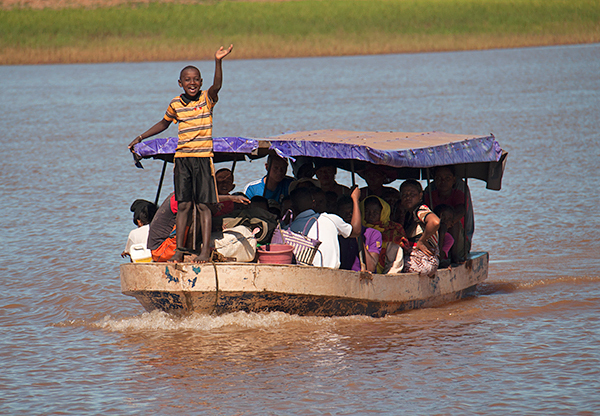 Mindat boats at Manambolo river. R. Zeilstra photo. 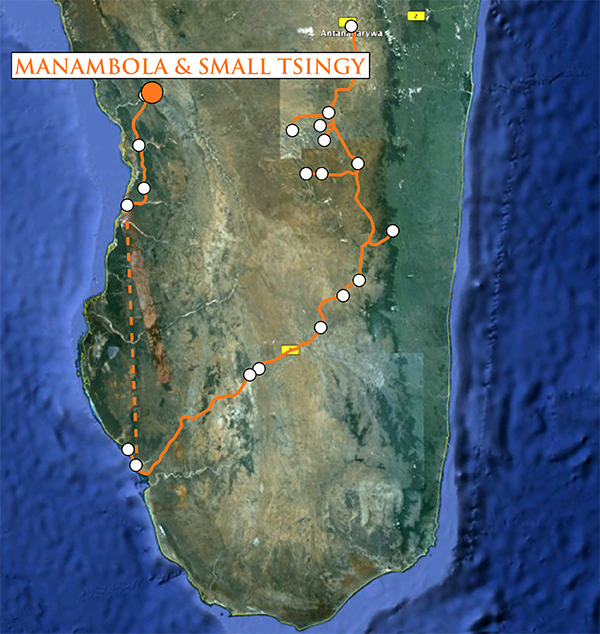 Going along Manambolo. J. Rakovan photo. Visiting one of the caves. R. Lang photo. Cave in the Manambolo george. E. Petrides photo. Travelling along Manambolo. R. Lang photo. Travelling along Manambolo. K. Doxsee photo. 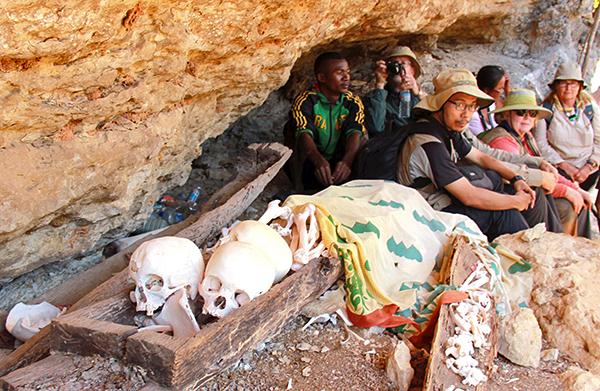 We visited also old traditional tombs. R. Zeilstra photo. Skulls in the traditional graves. S. Szlinke photo. Comning back to Bekopaka. J. Rakovan photo. Next attraction was the small tsingy. R. Lang photo. Wasps nest. E. Petrides photo. 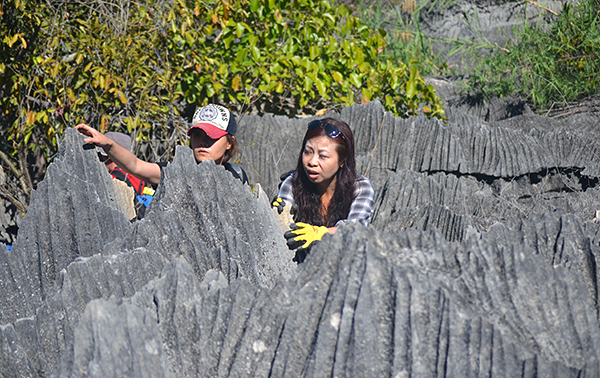 Lower parts of the tsingy are accessible only with very narrow cracks. E. Petrides photo. 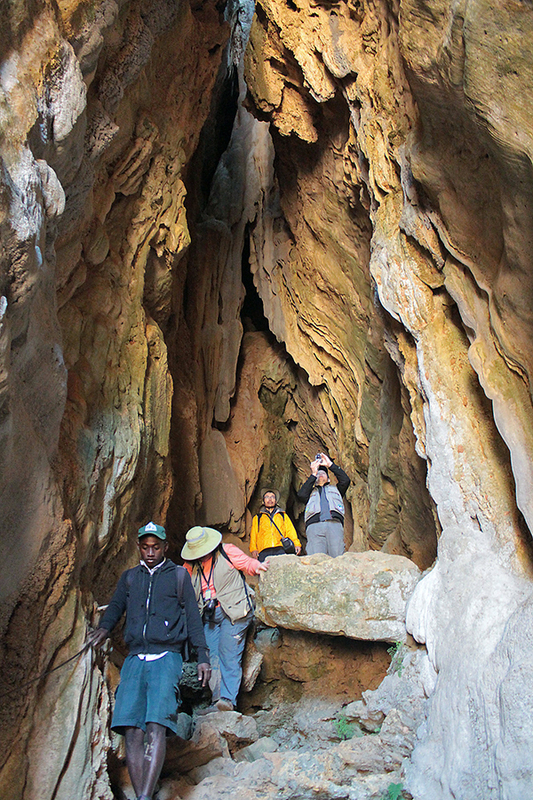 Lower level of the tsingy, labirynth of the corridors. E. Petrides photo. 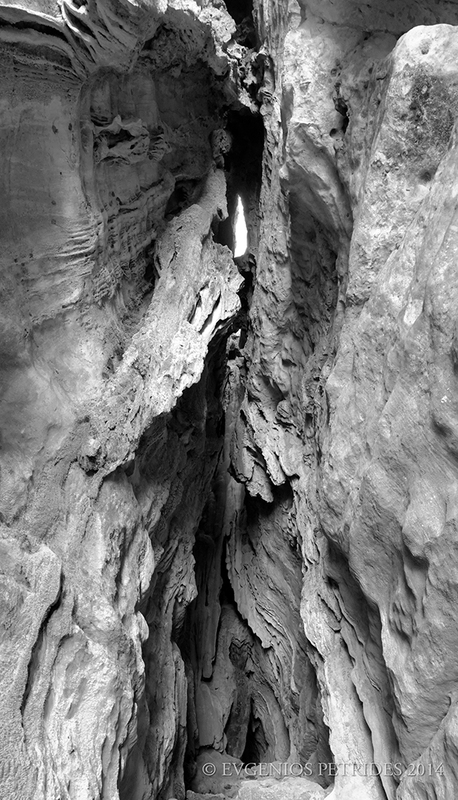 Lower level of the tsingy. E. Petrides photo. And these are "tsingy" - very sharp calcerous pinacles. R. Lang photo. Walking through them is sometimes very difficoult. E. Petrides photo. 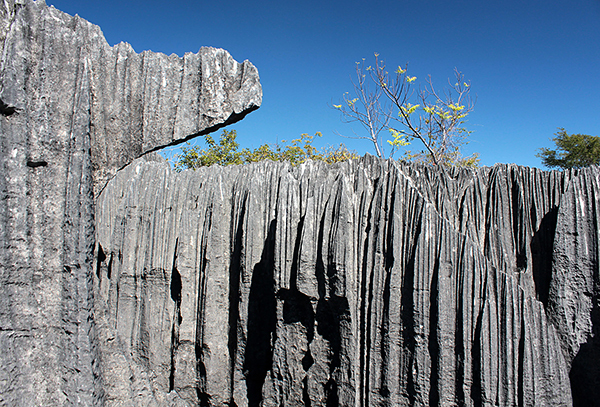 Tsingy are the result of the chemical weathering of limestone in the hot and wet climate. R. Lang photo. Conquering tsingy. N. Anstee photo. Finally we came back to our luxury hotel, we had time to relax. M. Yu photo. Some of us found animals in their rooms. M. Yu photo. Lizard in the hotel. R. Lang photo. Snake in Bekopaka. R. Lang photo. Part of the group went for nocturnal visit in the Park. 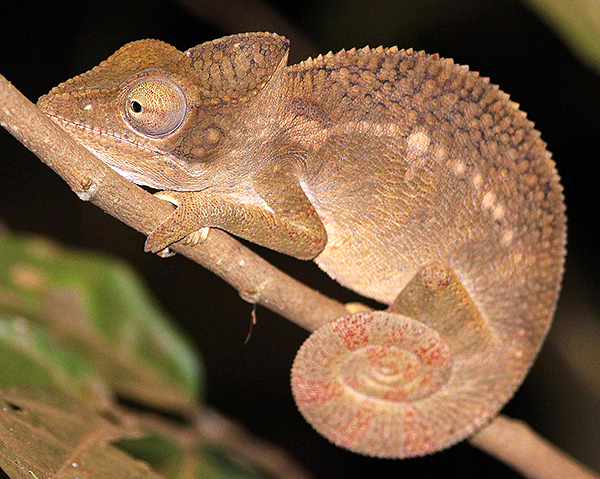 Nocturnal chameleon. R. Lang photo. 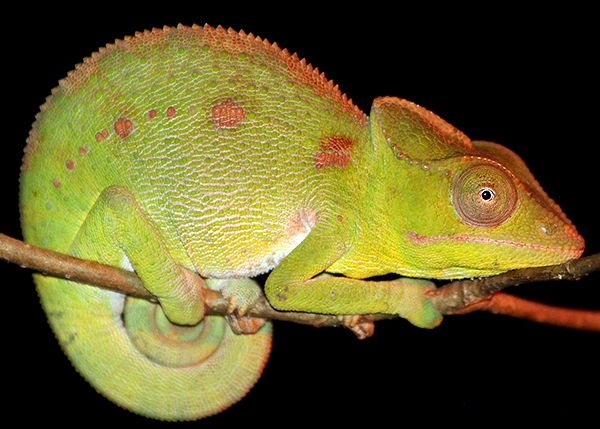 Nocturnal chameleon. R. Lang photo. Microcebus - nocturnal Mouse lemur, the smallest known lemur, it weights only 40 grams and is 10 cm big. R. Lang photo. 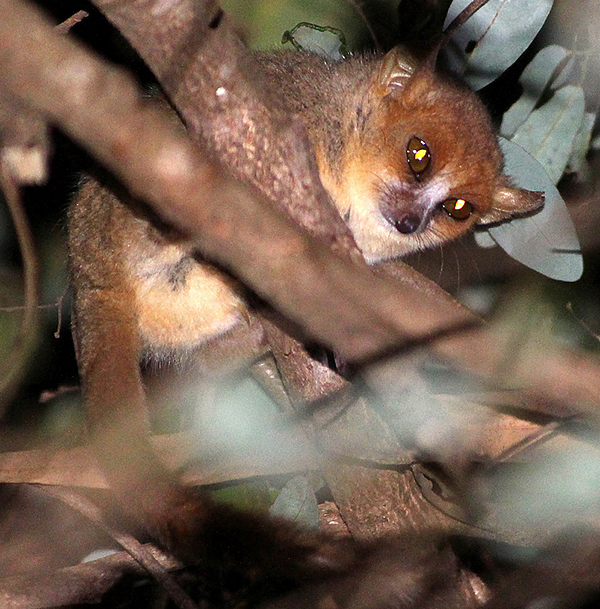 Microcebus - nocturnal Mouse lemur, the smallest known lemur, it weights only 40 grams and is 10 cm big. S. Szlinke photo.